In 2011, Rise of the Planet of the Apes nabbed nearly a half a billion in worldwide box office revenue, birthed a new star in Caesar (the CGI chimpanzee), and taught us all the importance of cookie-ing rocket. In short, it was unexpectedly great and, seeing how its ending left us with the rich seeds of monkey uprising, a sequel was inevitable. And here it comes now! 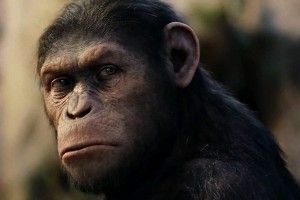 It’s called Dawn of the Planet of the Apes, and it’s currently director-less: Rupert Wyatt, who was in charge on the first go, recently dropped off the project due to time constraints. I’m hearing that Cloverfield‘s Matt Reeves is atop the list, along with The Disappearance Of Alice Creed helmer J Blakeson, 28 Weeks Later helmer Juan Carlos Fresnadillo, Take Shelter and Mud director Jeff Nichols, Pacific Rim helmer Guillermo del Toro, The Impossible helmer Juan Antonio Bayona and Looper helmer Rian Johnson (Johnson’s reps deny he is in the hunt). Del Toro is the biggest name of the bunch, and it seems like a bit of a long shot that he’d come in as a hired gun. (He is, in the best way possible, a bit of an obsessive). Joseph Gordon-Levitt’s weird prosthetic face in Looper aside, Johnson would be great also. Too bad it looks like he’s already turning down the gig. But the rest of the bunch is plenty solid, more or less a can’t-miss crew. Damn good to know Fox is respecting the sanctity of this new Apes franchise. There’s nothing less than adorable monkey revolution at stake.